While strolling the carpeted floors of the Los Angeles Auto Show this week (Press days were Nov 18-20, open to the public Nov 21-28) I happened upon the Ford booth and get to take a look at the new 2015 Ford Mustang 2.3 EcoBoost. The new 310 horsepower 2.3 liter inline-4 puts turbocharged power back into the Mustang for the first time since 1986, but spending 25 to 30 large on a new car seems imprudent when you consider that it'll be worth half that in 3-5 years. 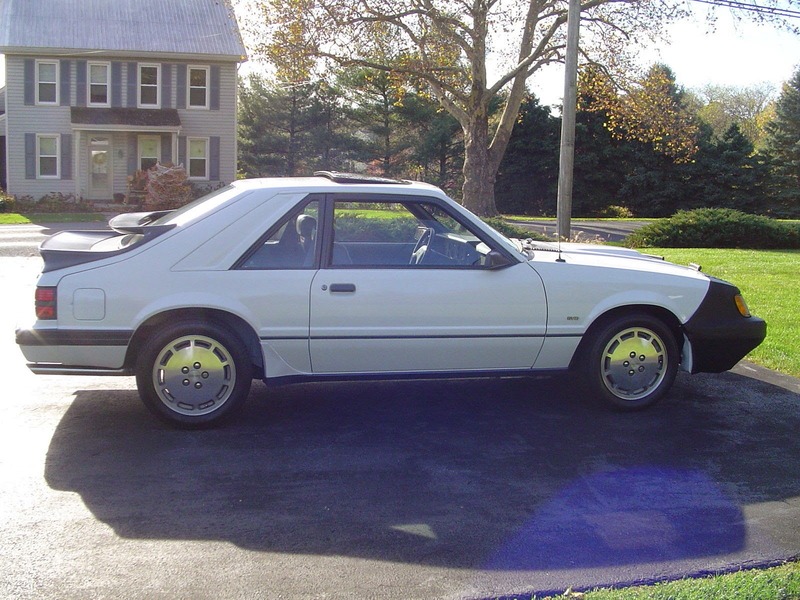 For that much coin you could pick up a classic fastback and still have money left over for a 1986 Ford Mustang SVO like this one here on eBay , currently bidding for $5,100 reserve-not-met with 1 day to go, located in Lititz, PA. 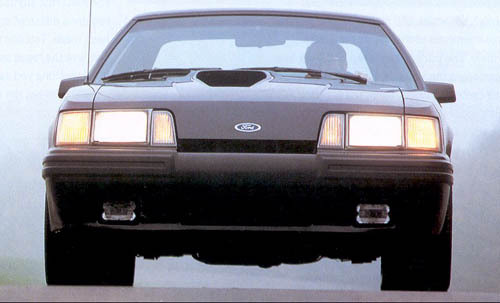 When the Fox Mustang was released in 1979 Ford enthusiasts were thrilled with the re-emergence of a properly proportioned Mustang with a renewed focus on V8 performance. Few expected that a Special Vehicles Team version would appear in 1984 with a turbocharged 4-banger that was faster (maybe? ), more expensive (definitely), and cooler (oh yeah!) than the V8. 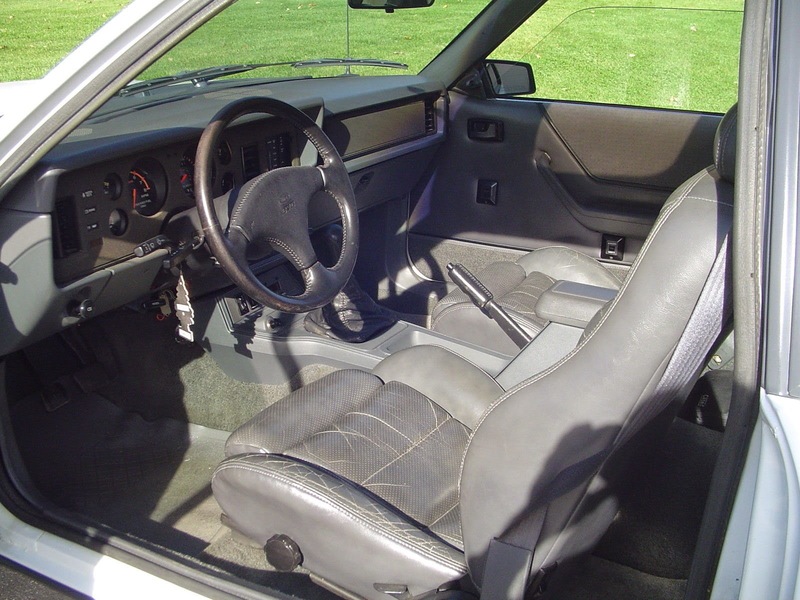 The SVO shunned traditional "no replacement for displacement" mantra with a turbocharged and intercooled Ford Pinto derived 2.3 liter SOHC inline-4, good for 200 horsepower and 240 ft-lbs of torque in 1986. Power is not overwhelming in the SVO, but it is peppy enough to push the stock Koni-adjustable shock equipped chassis around with some gusto. The hood scoop is just off-center enough to look accidental. Check it out. This mustang with a new Eco boost should make it peppy. I wonder if they will be selling it as a crate engine? From what I have heard, real world experience with Eco-boost is far from the EPA predictions. Personally, I am looking at a 2015 Mustang with the normally aspirated 300 hp V-6 and a six-speed. I am betting that real-world fuel economy will be about the same as the Eco-boost, but on regular fuel. But enough about me.... this looks like a nice well-preserved SVO. It will be interesting to see where the reserve is. I consider myself a fair hypermiler. 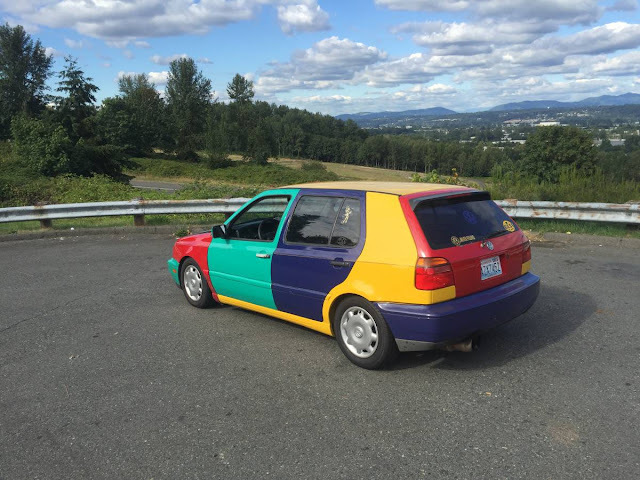 Not the best, but not awful at it either. 25+mpg (hwy) in my 4x4 '98 4Runner limited is something I see regularly on the highway. I once recorded 30mpg in a rented '04 DTS and 32mpg in a battered, borrowed, track rat E46 328i. I tried in a rented '13 Fusion EcoBoost and could not touch the EPA hwy number. Closest I came was 34mpg (EPA 37mpg HWY) between 100% highway driven fill-ups, all the while the onboard computer was prominently, and incorrectly, displaying 40+mpg. Granted, that was only one car, and a rental at that, but it was sub-10,000 miles and seemed in good shape. Still, I was pretty disappointed. I haven't had the chance to try it again, but judging from the chatter I've read on the inter-tubes, my experience was pretty much par for the course. So in a really long-winded way, what I'm trying to say is that I agree with Bobinott. I bet if you drove that N/A V6 'stang conservatively, you could get closer to the EPA numbers of an EcoBoost 'stang than an EcoBoost 'stang could if driven the same way. When I saw 'rented '13 Fusion Ecoboost' it made me wonder about the starting level of the tank and the type of fuel. I'm no hyper miler (in fact probably the opposite) but.. I am pretty good at bringing rental cars back with the needle showing 'full' when they've had a fair amount of miles driven since that last topping off. There's also the matter of what "gas" was in the tank of the rental. Depending upon where you rented it, it could have had a tank full of E-85 (which is now abundant in some areas) which would account for a significant loss of "mpg". Here in CA our family turismo loses about 3 mpg here in CA due to ethanol content in the 91 octane fuel. It does significantly better with 93 octane without the ethanol. We used to see about 3mpg variability in station-to-station (in MI) until we found the one with the best fuel (Costco). Only difference was..the trip computer usually recalculated after just a mile or so to let us know when we'd found more ethanol than we thought we'd bought. If the Fusion had been topped off with the cheapest low octane with ethanol that would account for some of it. Warning, multiple non-scientifically backed anecdotes follow. Continue at your own risk. We drove the Fusion from San Diego to Seattle on our 2 week long honeymoon. We had plenty of time to experiment with fuel grades and driving styles. I've forgotten what our best observed economy was using, but I didn't start putting 91 octane in the thing until we hit Oregon, and it wasn't any better. OK technically I didn't put the 91 in, as apparently you can't pump your own gas in Oregon, so some tweaker put the 91 in for me. Doesn't change the fact that our economy didn't increase. I'll concede that Ford is probably right on a technicality, just like Hyundai was with their 40mpg claims while empty driving down hill with helium filled tires and a tailwind. But what good are those numbers if they're not attainable outside of the "train-to-the-test" EPA cycle? The Fusion (and my old '98 Durango) were the only 2 cars I've never been able to hit the EPA numbers on in my life. The Durango was wearing 32" Mud Terrains, ~400lbs of trail armor, 3" inches of lift and truck nuts. What's the Fusion's excuse? This is exactly my concern with the plethora of new high-horsepower high-(claimed)-fuel economy cars on the market right now. It seems like it is too much like manufacturers claiming we can have our cake and eat it too. It seems that with modern engine management systems it should be sufficiently easy to game the EPA system. I'd like media outlets to really beat on the manufacturers and really make it clear that they can or can not match EPA test results. Ideally, the EPA would do some kind of real world random testing to corroborate their test results but I won't hold my breath on that.